Of course you buy an inexpensive Chinese made folding picnic table to carry in the Morgan but for those who want something special matched to their car I am offering to make you a picnic table. Made to fit neatly onto the floor of the luggage compartment and only 25mm thick when folded, these bespoke tables don't rob you of valuable space and have enough room on top for two people to wine and dine. Totally made to order, each table consists of a hand laid fibreglass top with indented Morgan motif and sturdy steel legs. 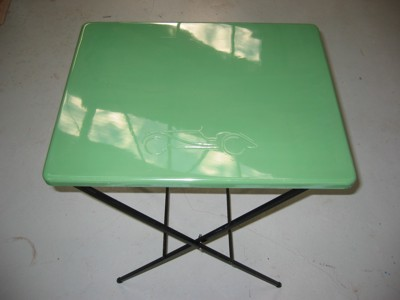 Tables are made in a choice of glossy resin colours - click here to see the colour range. AUD$220 in your choice of colour. Can be posted within Australia and overseas. Please check with me for a price.